Bonnet Creek is a beautiful property, surrounded on three sides by the Walt Disney World Resort. The entrance is right next to Disney's Caribbean Beach Resort, and the location is arguably the best of any off-property resort. The Waldorf Astoria is a Four Diamond-rated hotel located next door to the Hilton at Bonnet Creek with which it shares complimentary bus transportation to the Walt Disney World theme parks. The opportunity to stay in a luxury resort in such a convenient location at a fraction of the cost to stay at an equivalent Disney resort sold us on giving an off-property resort a try! We stayed in a Deluxe Double Queen room, which is one of the most basic offered at the Waldorf Astoria. With two queen beds, this room sleeps up to four guests. 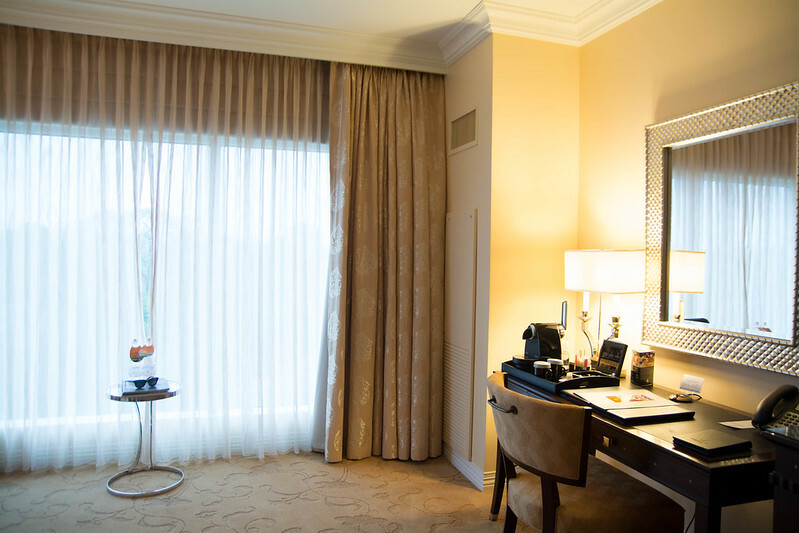 Though one of the smallest guest rooms at the Waldorf... at 448 square feet, the room is HUGE for a standard room! And for comparison, the largest standard room at a Disney Resort is 440 square feet at the Grand Floridian Resort & Spa. Our room at the Waldorf Astoria was plush, outfitted with textured carpet, Egyptian cotton bedding, and marble tile in the bathrooms. The Waldorf also has twice-daily housekeeping. For turn down service in the evenings, they dim the lights, set out robes and slippers on a towel placed on the floor between the beds, and change the television to a jazz music channel. However, with the elaborate turn-down, we found that housekeeping would overlook simple things like replacing dirty towels or emptying the ice bucket. 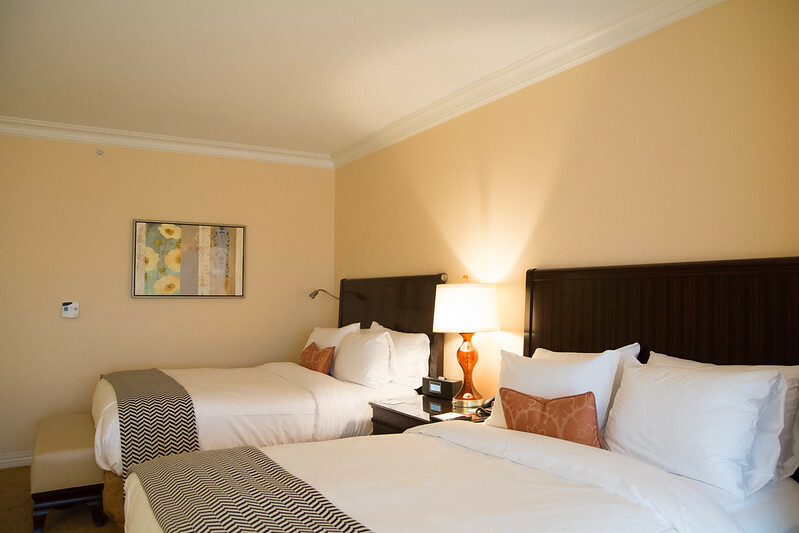 The room is equipped with a 42" high-definition LCD television, blu-ray player, and premium sound system. On the desk pictured below, you'll notice the Nespresso machine. The tray of coffees and teas was complimentary and replenished throughout our stay. You'll also notice a corded mess behind the desk... they should really take some twist ties and get to work on that. The bathroom is large and lovely, but I must admit that it doesn't really meet my requirements of a high-functioning hotel lavatory. There is only one sink in the vanity which is located within the bathroom. Personally, I prefer when the sink is separated from the toilet, or at least the shower, to better accommodate multiple people getting ready. I would have also appreciated to have a second sink, and I'm really not sure why they didn't include another, as they were clearly not lacking in overall bathroom square footage. In addition to the shower, the bathroom has a large soaking tub. I'm not a big bathtub person, but Rachel and my mother took advantage of the opportunity to soak after a long day of walking at the parks. And the shower is clear glass. Clearly, the designer of this bathroom did not intend for multiple people to get ready at the same time because if someone is in the clear glass shower, then the person standing at the sink can see EVERYTHING in the reflection in the mirror. Another person can't even use the toilet without invading another's privacy. Also, while the room was large, I found it to be furnished a bit oddly. It seemed to be missing furniture, and specifically, why was there a lonely little glass table sitting by the window? That space could have been filled with an armchair, a small table and chairs, or a love seat.... though I cannot complain too much, as Rachel and I used all of the space in front of the window to unfold and live out of our many suitcases. As I was doing a bit of post-stay research for this post, I realized that I wasn't crazy - our room was indeed missing an armchair pictured on the floor plan! The standard rooms at the Waldorf Astoria are a tiny bit larger than those at the Grand Floridian (and even more so if you stay in one of the charming dormer rooms). However, the Grand Floridian's standard rooms have a maximum capacity of five people with two queens and a daybed while the Waldorf Astoria's standards only sleep four. As for outdoor space, all guest rooms at the Grand Floridian have balconies, while the Waldorf Astoria only has balconies for certain category suites. The decor at both resorts is quite comparable in luxury. 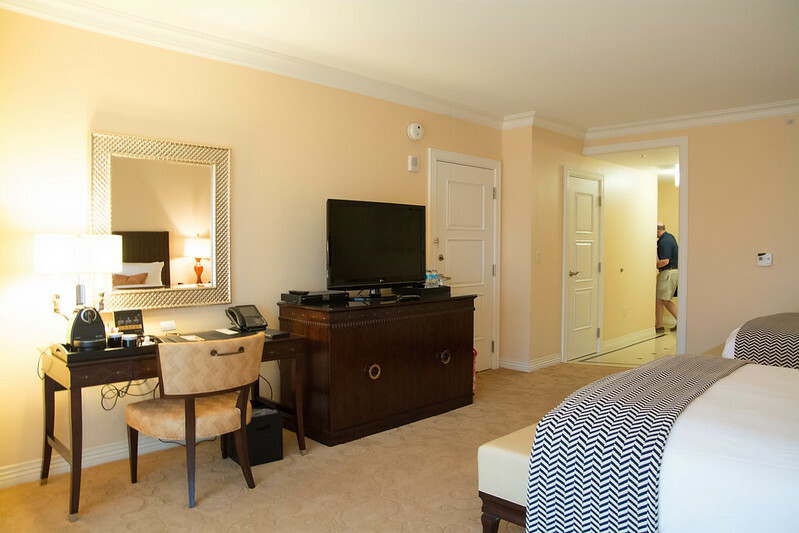 Since the Grand Floridian rooms received refurbishment in 2014, the decor is much more updated to fit the standards of today's luxury, but while still characteristic of the resort's Victorian theme. The Waldorf rooms are a bit more neutral in color. 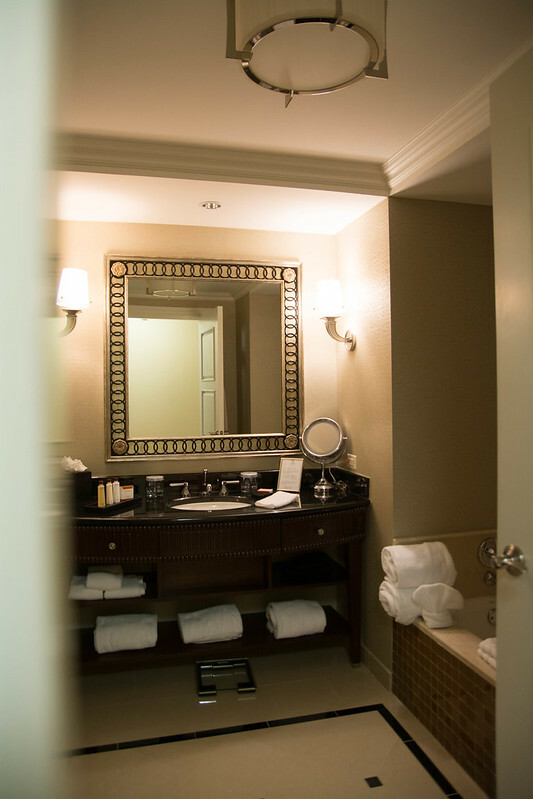 In my opinion, where the Grand Floridian takes the edge in room design is with the bathroom layout. Instead of one large bathroom, the Grand Floridian has a room with a bathtub/shower and toilet with a double vanity outside of the bathroom. This is a much better arrangement for families to get ready productively at the same time. 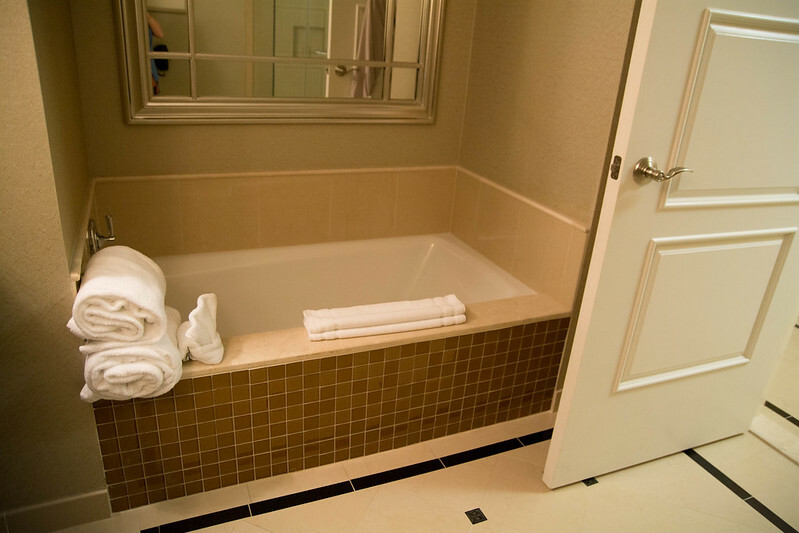 However, the Waldorf does have a wonderful shower and soaking tub, rather than one standard bathtub. Both of the resorts have large flat-screen televisions, though the Waldorf Astoria also provides a Blu-ray player. While there is a coffee maker at both resorts, I think the Waldorf wins in quantity of flavors offered, as well as overall taste. 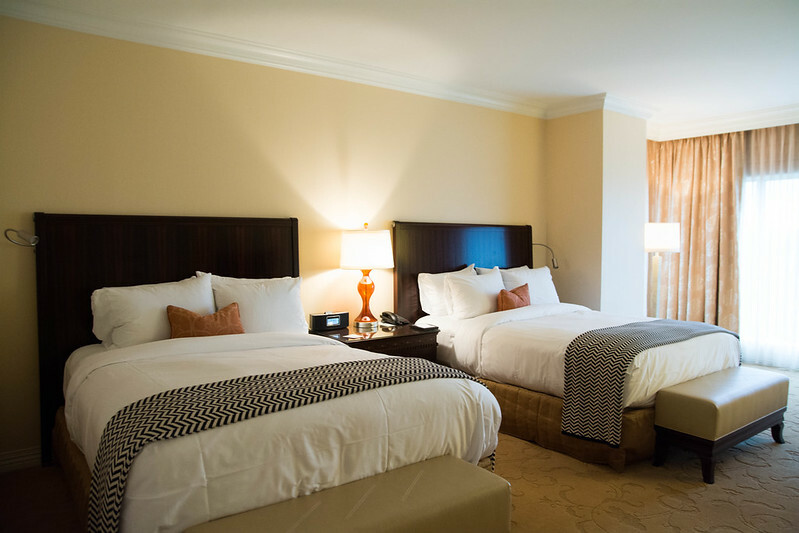 Another luxury offered in all rooms at both resorts is complementary nightly turn-down service with chocolates (the Grand Floridian is the only Disney resort to provide nightly turn-down to all room categories). While I missed staying in a room with Disney touches, I appreciated the attention to detail at the Waldorf Astoria. 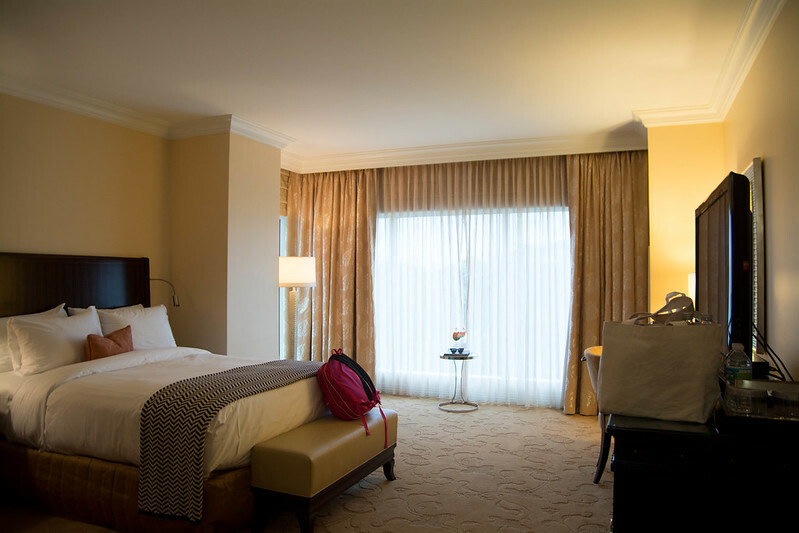 Offering luxury at often half the price of an equivalent room at the Grand Floridian, the Waldorf Astoria at Bonnet Creek is a great value and a property which I wouldn't hesitate to stay at again.